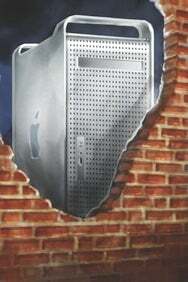 To ipfw, Leopard adds a new socket-filter firewall (also known as an application firewall). Rather than using network ports and IP addresses to decide whether to allow a packet, it bases its decision on the application making the network request. When a program asks to accept network traffic, a socket filter checks a list of programs that have been authorized to do so. If the program is on the list, the firewall allows the connection. If the program isn’t on the list—as in the case of new or upgraded software—OS X asks you whether to allow the program to accept incoming traffic. The Security preference pane lets you configure OS X’s built-in socket-filter firewall, which filters network traffic by application. You enable Leopard’s socket firewall by selecting Set Access For Specific Services And Applications in the Firewall tab of the Security preference pane. When you select that option, you’ll see a list of allowed and blocked programs. If you’d like to block all nonessential traffic, you can select Allow Only Essential Services, but beware: doing so will break some applications. You’ll still be able to browse the Web and use e-mail, but other inbound connections will be blocked. Socket filters are less flexible than a packet filter like ipfw. Applications that are allowed to accept network connections will accept them from anywhere on the Internet; they can’t be told to distinguish trusted from untrusted Net addresses. The Leopard firewall also blocks only inbound connections; it won’t prevent programs from making outbound connections. This has become a big problem in the Windows world: spyware programs lodge themselves on hard drives and then “phone home” with sensitive private information. While OS X 10.5 still includes ipfw, it’s effectively disabled by default. But you can enable and configure it from the command line or through a third-party application such as Hanynet’s free WaterRoof 2.0 ( ) or NoobProof 1.1 ( ). And ipfw is compatible with Leopard’s socket filter, so you can combine the two to block untrusted applications from accepting connections and simultaneously restrict inbound and outbound traffic by ports and IP addresses. So why would you want to buy and install a third-party firewall when OS X’s seem to cover the bases pretty well? The primary reasons are more flexibility and better protection. For example, Intego’s $50 NetBarrier X5 ( ) lets you set rules based on where connections are coming from. You can get similar firewall control from free tools such as WaterRoof, but they don’t offer those extra privacy features. Another limitation of Leopard’s built-in socket filter is that it can’t change rules when you change locations. For example, you might want to leave your laptop’s iTunes sharing turned on at home but shut it off when you use your laptop on the road. Open Door Networks’ $80 DoorStop X Security Suite ( ) lets you define locations and quickly set the firewall to preset rules for where you are. NetBarrier also allows you to create different rules for local network addresses and for addresses on the Internet—a remarkably simple and useful distinction. If you want fine-grained application control—defining not only which applications can send and receive information to and from the Internet, but also which Net addresses they can contact—you can use Objective Development’s $30 Little Snitch( ); it’s particularly effective against spyware. 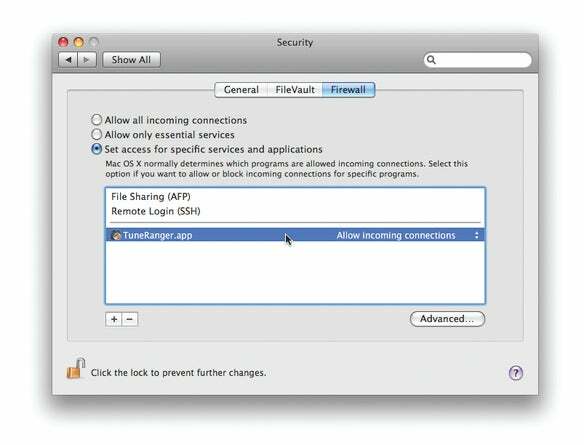 For most users, the firewalls built into OS X are enough. Enable OS X’s basic socket-filter firewall via the Security preference pane (we recommend that you choose Set Access For Specific Services And Applications); if you want the extra protection of OS X’s ipfw firewall, use the excellent and free NoobProof to configure it.